For this week's Tuesdays with Dorie selection, Lisa of Surviving Oz chose Tribute to Katharine Hepburn Brownies on pages 96 and 97 of Dorie's book, Baking: From My Home to Yours. Lisa designed our group's new logo! Isn't it grand?! After Katharine Hepburn died, eulogies came from every quarter, many including stories about her brownies. In an article sent to me by my friend Bon Appetit editor in chief Barbara Fairchild, Heather Henderson of St. Paul, Minnesota, recalled wanting to quit her studies at Bryn Mawr. Her father managed to get Miss Hepburn, a Bryn Mawr alum and a neighbor, to intervene. The famous Kate invited both the young woman and her father to her home one afternoon. At tea, Ms. Henderson got a taste of the legendary brownies as well as of the actress's views on education. In her tribute to the actress, Ms. Henderson wrote, "I'll always be grateful to Miss Hepburn for making me stick it out at Bryn Mawr and for giving me these rules to live by: 1. Never quit; 2. Be yourself and 3. Don't put too much flour in your brownies." And just like Katharine dictates, this has really very very little flour! 1/4 cup for an 8" square! I also used 1 1/2 t of espresso powder instead of 2 t of instant coffee. I think I put in a wee bit too much espresso. The brownies were very fudgy, and I'm more of a cake brownie girl, but they were fun to make! Very very easy. You only really need a saucepan! 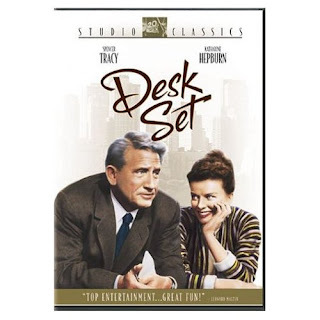 Katharine Hepburn plays a LIBRARIAN in Desk Set! Dorie Greenspan was on NPR's All Things Considered (February 13, 2007) and posted the recipe and story about Katharine Hepburn Brownies. Yours look so pretty, all stacked on the plate like that! Great job - they look delicious! Your brownies look perfect. YUM! Cake vs. fudgey - the great debate goes on. I like 'em fudgey, so these are perfect for me! words to live by. thanks for the brownie education! I am a fudgey brownie girl so I loved these! Fantastic looking brownies. With so many more brownie recipes to still make in the book, I bet we get a very cakey one that will be more to your liking. these look so good! I love fudgy brownies! Can you save me some? I love fudgey brownies! These look awesome. I am crazy for brownies! These look perfectly moist and wonderful. I have to say also that this movie is one of my absolute favorites! My husband loves it too! Can you believe the size of that computer? Looove fudgey brownies and I love Katharine Hepburn. These look fantastic. These look like the perfect brownies. I can't imagine a better looking brownie, and I bet they tasted just as good! Your brownies look fabulous! I also used espresso powder in my brownies. Nice pictures! Great minds think alike (Desk Set)! Love your brownies - I thought the espresso powder was a must! The fudgy-ness won me over as well. Nicely done! Those look perfect! Especially on that super nice cake plate of yours! P.s. : I'm still waiting to make the layered Jell-o, but you never answered my question (or I don't think) ...and it was a serious question: how do you get the Jell-o to unmold so perfectly!??? These were sooooo good!! Yours look absolutely perfect! I really liked these brownies. Your batch looks so pretty, I just want to reach in and grab one! brown perfection-- you did katharine proud! and you got that crackly top that mine didn't seem to have. Fantastic brownies! I've tried this recipe and I know it's very delicious, yours looks perfect! Your brownies look stunning with all of the nuts and chocolate in there! Fantastic job. Isn't Desk Set great?! Very pretty picture of your brownies! Those brownies look amazing! I'm with you though - they were a bit too fudgy and rich for me, but still fun to make! Your brownies looks so pretty! These are definitely fudgey brownies, and really good ones, at that! I guess it makes sense that you like cakey brownies, since you are the queen of cakes! These look incredibly fudgey, just like I like 'em. I can't believe how little flour there is in these. What a beautiful plate of brownies! ok. really. can I make it through the day without making these? also; how many recipes from your site have I made now?! countless! excellent work, photos, and recipes. thanks!